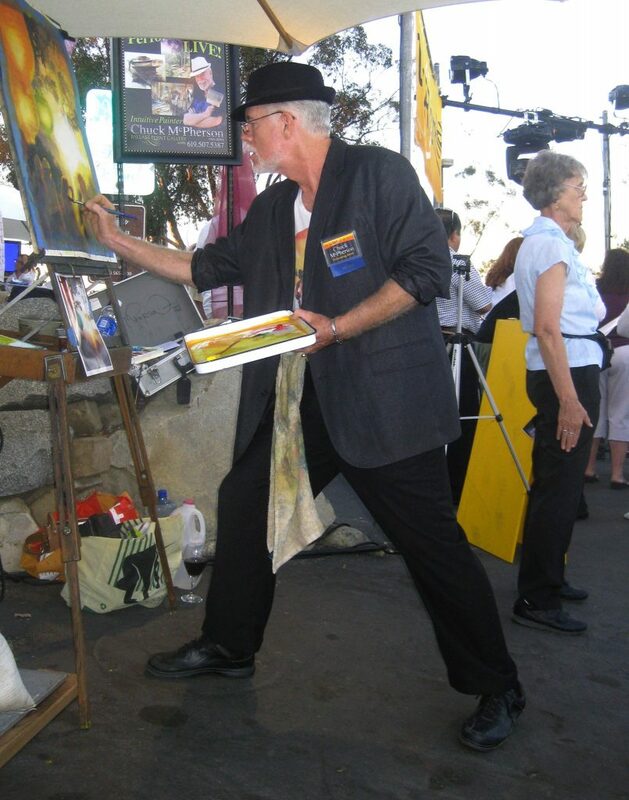 San Diego Watercolor Society members are a constant source of inspiration. When we learned that Chuck McPherson, one of our well-known artists, had a special local exhibit happening we knew we had to share the details with you. Please read on and learn more. We’ve learned that some of your artwork is featured in a local exhibit. Can you tell us a little bit about it? 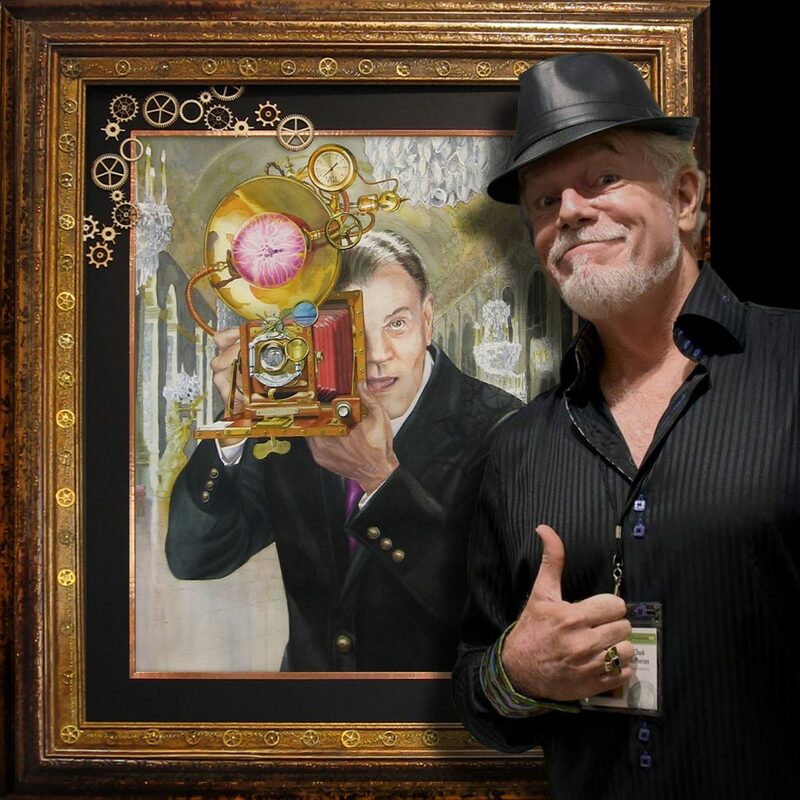 The Dr. William C. Herrick Community Health Care Library in La Mesa invited me to hang a solo exhibition through June 2019. I delivered 14 large watercolors, mixed media and oils. One, a latex and acrylic abstract that is 10-feet tall brought an “Oh MY!” from Director, Kathy Quinn. Once the artwork was placed, she mentioned how happy she was to have some larger work hanging. And I have to say, it all displays beautifully! The Library is at 9001 Wakarusa St, La Mesa, CA 91942 and open to the public, so go see! I have stopped doing shows in restaurants, libraries, and such, because in art you can volunteer yourself into the poorhouse. That said, a friend described the library and mentioned that, because of it’s location across from Sharp Grossmont Hospital, not a lot of foot traffic comes in. I do have people that pay attention to my art exploits, and am using that “exposure” to help bring awareness to this unique facility… my way of “giving back” to the community. Wnhen I entered the building, I liked what I saw. And an original James Hubbell fountain resides out in the courtyard whose soothing pool made me take a breath. While I can’t sell directly during the show, I am hoping to share my available classes and weekend workshops, like “Composition and Narrative” at SDWS on September 7th/8th. Style. Well, now that’s a question. I have four distinct disciplines ~ realistic, expressionistic, “Wild Child” (with my 6-inch brush, mainly for public appearances), and abstraction. That last is not to be confused with abstract, which I have a healthy respect for because it is very difficult to pull off non-subjectively. Abstraction is simply painting something recognizable with a twist on perspective, space, shape or color. I could talk about stuff all day, but interested peeps can ask me anything when we’re at a show reception or attend my classes around town for an in-depth lesson. The next day I decided to take a full pan set of LUKAS Watercolors, thinking I’d hold attention better painting faster. I also remembered the artists watching kept asking what color I was using. Man! That was really annoying. BUT, at least they were sitting longer and more people began showing up. So on the third day, I brought a 5-inch brush that I’d painted my house with; when that same question arose, I picked up the pan set (each pan about an inch by half an inch), stroked the wet brush vigorously up and down the colors, and answered ‘the LEFT ROW!” as I slammed the giant brush on the paper. THAT is what spread over the grapevine and by the end of my Fair demos, the staff were scrambling for bench seating to handle the 20+ watchers under the tent. I was OFF and my “Wild Child” style was born! This was my first real exposure to watercolor in 30 years and why my name is known locally. I’ve never looked back. Chuck with “Punktographer”, a watercolor in custom Steampunk frame customized with the people who commissioned the portrait for a friend. The SDWS is my home Gallery and FAMILY! I absolutely love the artists I’ve met during my 12 years as a member. The quality of artwork is consistently stunning and my artwork has done very well being juried into all but five shows I’ve entered. My first experience at SDWS was like a lot of newbies walking into a 4,000 square foot watermedia mecca… intimidation! Carol Mansfield, Jim Millard, Carol Thompson, June Maxion all blew me away with their efforts. I thought, I can’t compete with this. BUT, instead of leaving rejected, I came back with a vengeance and was just myself. I didn’t hold my work up to them as a measurement of ability. Heck, I would have to paint another 40 years to be on their level. So I’ve concentrated on strong composition and an underlying narrative in what I paint that brings attention and awards. To date, I hold three Signatures. My paintings have been awarded 42 times in Member Shows, including the April 2009 show for “Golden Eye”. And my artwork has been accepted and awarded in numerous International Exhibitions; I’ve even sold a few. The best way to follow me… hmmm. About five feet to either side. OH WAIT! That’s stalkers. People can find me at the San Diego Watercolor First Friday events pretty consistently, out and about doing Paintformances and on the web at chuckmcphersonart.com or on FaceBook where I post often on where to find me. I make it SO easy don’t I? This entry was posted on Sunday, April 7th, 2019 at 1:03 am	and is filed under Member News. You can follow any responses to this entry through the RSS 2.0 feed. You can leave a response, or trackback from your own site. Thanks for the opportunity to answer such good questions SDWS! Thank you for sharing and inspiring all of us to continue with gratefulness with a sentence of humor. god Bless your future.